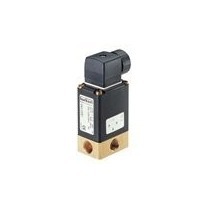 Tameson has a large selection of 3/2-way brass solenoid valves, which have 3 ports and 2 switching states that are electromechanically controlled. With 3 ports and 2 switching states, the valve can be either NC (normally closed), NO (normally open), mixing, distributing or universal. NC is most common: the valve has 1 input, 1 output, and an exhaust port. The output connects to exhaust with no power, and with power the input is connected to the output moving the media. They can also be designed as normally open (power to close) or bi-stable (latching). There is a wide array of selection criteria from orifice size, connection type, voltage, pressure range, operation, design, certification, seal material, and housing material to ensure you have the correct valve for your application. We have port sizes between 1/8” to 2” to cover the majority of applications, but for applications outside of this we also have you covered. AC or DC voltage coils are available depending on the electrical wiring available in the application. View our pressure ranges along with different solenoid valve operation types (direct, semi-direct, or indirect), as this will affect if you need a pressure differential for complete valve opening. If needed, we also have different versions, for example, medium separated, ATEX certified, or oil and fat free to meet your application requirements. The valve’s housing and sealing material will ultimately affect the type of media that can flow through the valve, but it is typically either gases or clean liquids. Please note that the internal parts of the solenoid valve are made of different materials (usually stainless steel 430F for the plunger). Medium separated valves separate these parts from the fluid. A solenoid valve is often selected due to good sealing properties, fast response time of typically between tenths to hundreds of milliseconds, durability, reliability, and a wide range of operation types and materials to find the right one for your application. The brass housing allows it to be used for water, air, oil or other neutral liquid media. View our chemical resistance chart to ensure that your housing and seal material are suitable for your media.